Author of several books in the PERMISSION TO BOOKS SERIES, Jill Murphy Long is a professional writer, certified yoga instructor, athlete, and teacher. She owned The Ad Group, was a partner and creative director/copywriter for ten years at Murphy & Watt Advertising, and worked for Foote, Cone and Belding, ADWEEK, and The Advertising Center. As a former advertising executive, she realized the importance of taking time each day to nap and play. Seven years ago, she quit her day job to write books for those who need this time the most - American women. 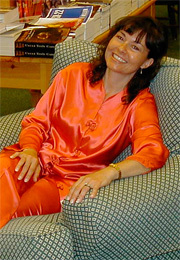 A graduate of California State University, Fullerton with a Bachelor of Arts in Communications, Ms. Long's best-selling first book, PERMISSION TO NAP, TAKING TIME TO RESTORE YOUR SPIRIT received the Excellence Award, a distinguished recognition presented by the Chicago Book Clinic and the 2003 Benjamin Franklin Award by the Publishers Marketing Association for being a finalist in the category of New Age (Metaphysics/Spirituality). Interviewed by NPR and other major metro radio stations, the author has also spoken at spa resorts, universities, bookstores, libraries, and many other, diverse retail locations. Press coverage of her first book included articles in: Dallas Morning News, Los Angeles Times, American West In-flight Magazine, Chicago Sun Times, EPregnancy, and the international spa magazine, Pulse, to name a few. 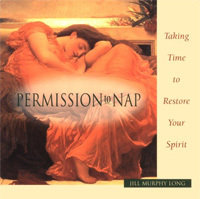 The second book in the PERMISSION BOOKS SERIES, PERMISSION TO PLAY, TAKING TIME TO RENEW YOUR SMILE, was published in April 2003 with 20,000 copies in the first printing. PERMISSION TO PLAY shows the reader ways to fit active, creative, and mind play in her days with the same convincing prose and beautiful artwork found in the first book of the series. The author has played all of her life both dabbling in the arts and trying new sports. This former collegiate alpine ski racer, Professional Ski Instructor of America (PSIA certified), and bike racer licensed under the United States Cycling Federation, speaks from experience of starting a new healthy habit and staying with it. Now a member of Wombats (Women on Mountain Bikes and Tea Society), the International Mountain Bike Association (IMBA), and a ski Ambassador for the Steamboat Ski Resort, Ms. Long still reserves time for naps and play between her writing and book tour schedule. Permission to Play has been featured in publications such as: Women's Health & Fitness, Delicious Living, Women's World, Inside Borders, Christian Science Monitor, and Philadelphia Daily News. The author has appeared on CBS and Fox television stations and has been interviewed by other numerous radio stations throughout North America. In June of 2004, a 12-month wall 2005 calendar produced by Portal and based on the best-selling book, Permission to Play, will be available. Filled with weekly motivational tips, creative sparks, and play ideas, each month opens with a beautiful, old-world masterpiece of women indulged in active, creative or mind play, and is graced with botanical illustrations. Scheduled for release in April 2003, is the third book in the series, Permission to Party, Taking Time to Celebrate and Enjoy Life and will also be available at fine bookstores and gift shops nationwide including eretailers such as: www.amazon.com, www.bn.com, www.booksamillion.com, www.walmart.com, www.target.com, and in direct mail catalogs and on line at: www.isabella.com, www.femailcreations.com, www.paragon.com, www.victoriantradingco.com, and www.stampington.com. The author has planned to write at least ten more books in this series and is currently writing book four, Permission to Soar, Taking Time to Live Your Dreams. A bibliophile herself, Ms. Long belongs to a reading club and has organized and led weekly writers' groups since 1998. This winter semester of 2004, she is the instructor of the Working Writers Workshop at the Colorado Mountain College and is attempting to finish one of her fiction books. The author happily makes her home in Steamboat Springs, Colorado with her husband and daughter, writing, and skiing or cycling-weather permitting-almost every day.